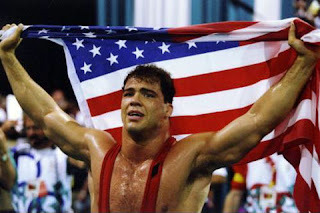 There were two BIG stories from the wrestling world this week already and it is only Monday Sept 5th 2011. 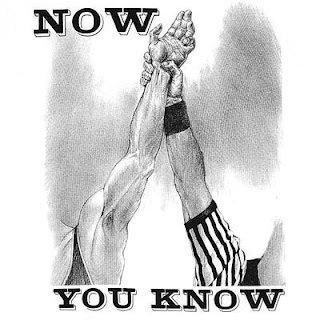 The WWE announced tonight during RAW tonight that they will get their own Network next year 2012!!!!!!!!!!!!!! Now they stated that all the big events would be on this Network and they showed a trailer for it. The other big news in the wrestling world is that Kurt Angle once again was caught drinking and driving. 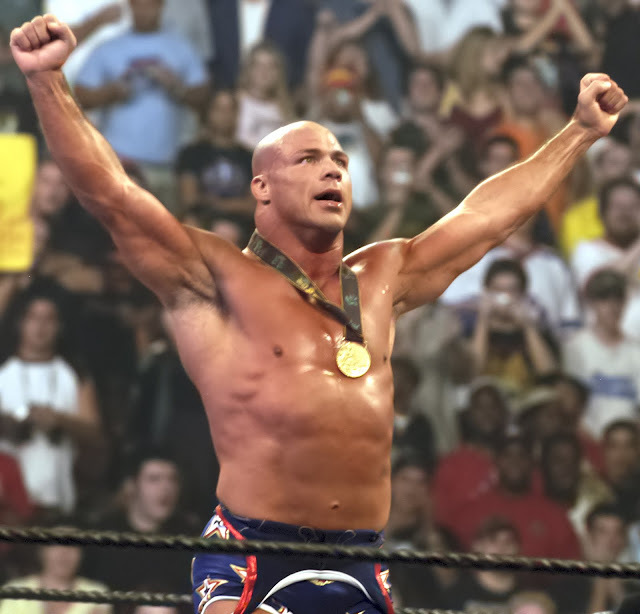 For those that do not know Kurt Angle won an Olympic Gold Medal(seen in picture above) for wrestling in 1996 with a broken neck. He is in training for another chance at Olympic gold but I am not sure whether or not this may change all of that. One thing is for sure he has more heart than most of the men and women wrestling today, that still does not change things. 2009 he was arrested after he assaulted and harassed his former girlfriend , the charges were later dropped. However at the time he was charged for driving with a suspended license. March 25 2011 he was arrested for being drunk in his car, he wasn't actually driving he was just drunk. I am not here to put the man down we all have our demons and whatever the case may be it is what it is.He is denying that he was drunk and only had a few but it will see its day in court. Matt Hardy a former WWE and TNA wrestler was arrested for a DUI in August of this year.He was fired from TNA(Impact Wrestling)the next day. Santino Marella WWE wrestler was injured Thursday Sept 1 2011 when a van in Toronto, Canada hit him when he was driving. Here is his quote from WWE website in regards to his accident. “I had just left home and was going to get my hair cut before I began packing for WWE’s trip to Puerto Rico,” explained Marella. “[My barber] wasn’t around, so I just decided to go home. He did suffer a separated shoulder and is expected to be out a few weeks.